For too many young people the transition to adulthood is characterized by isolation, joblessness, and a lack of educational opportunity or connection to caring community. In a far-reaching effort to help disconnected youth, nonprofits, foundations, and government agencies across the U.S. are providing support in the form of shelters, job training, mentorship, college prep, job placement, and mental and reproductive health services. But in order to achieve success it is clear that these efforts require greater alignment and coordination. This special collection gathers the many lessons being learned in the field; lessons about the challenges in meeting the needs of disconnected youth and the promise of both new and more proven approaches. Image courtesy of Richard Ross, from "Families Unlocking Futures". For youth involved in the criminal justice system, a better future depends on improving their social and emotional learning skills -- skills like conflict resolution, career readiness and preparation for the future. An assessment by the Urban Institute shows how the Arts Infusion Initiative helped achieve just that for young people detained in the Cook County Juvenile Temporary Detention Center (JTDC), and for high-risk youth in the Lawndale, Little Village, Back of the Yards and South Shore communities. From 2010 to 2015, this catalytic approach to restoring the peace for Chicago's youth supported 14 nonprofits providing teens with rigorous arts instruction, infused with social and emotional learning goals. Funded by The Chicago Community Trust, the $2.5 million Initiative built collaborations with the Chicago Police Department, Chicago Public Schools, and Northwestern and Loyola Universities. 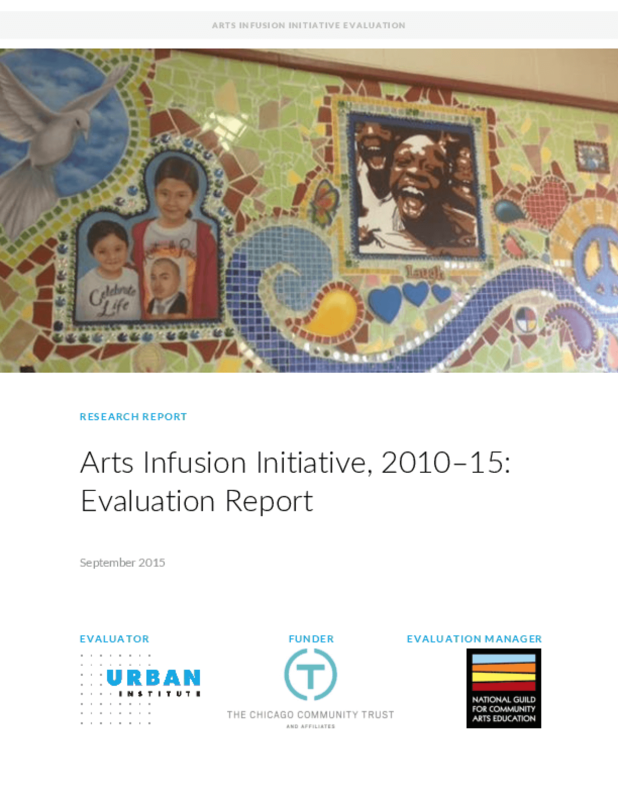 The Urban Institute's mixed-method evaluation (2.9MB), commissioned by the National Guild for Community Arts Education with funding from the Trust, concluded that "the fields of education, juvenile justice and family and youth services can benefit tremendously from the emergent approaches embodied in the Arts Infusion Initiative." Among the successes their research revealed: Participants showed substantial improvements in social and emotional learning skills, as measured by conflict resolution, future orientation, critical response and career readiness. Improvements ranged from 27% in conflict resolution and career readiness, to 29% for critical response and 36% for future orientation. The initiative helped foster collaboration between program directors, public schools, community policing and the detention center. Examples include the Trust and the Chicago Alternative Policing Strategy program working together to open a high-tech digital music lab at JTDC. Chicago Public Schools' plan for a new Digital Arts Career Academy for at-risk and court-involved high school youth is a direct result of the positive effects Arts Infusion had on youth, and of the relationship forged between CPS and the Trust. The program exposed at-risk youth to new skills and technologies that opened their minds to a positive future. Arts Infusion grants enabled many participating programs to purchase -- often for the first time -- modern, professional-grade equipment to which many youth had never been exposed. Better Boys Foundation used its funding to purchase enough modern film lab equipment to serve a full 17-student class -- previous classes had only one camera to share among all students. According to a 2008 AFCARS report from the U.S. Department of Health and Human Services (http://www.acf.hhs.gov/programs/cb/stats_research/afcars/tar/report14.htm), over 26,000 youth age out of the foster care system each year. Research shows that youth who leave foster care are more likely to drop out of high school, to be unemployed, and to be dependent on public assistance when compared to other youth. 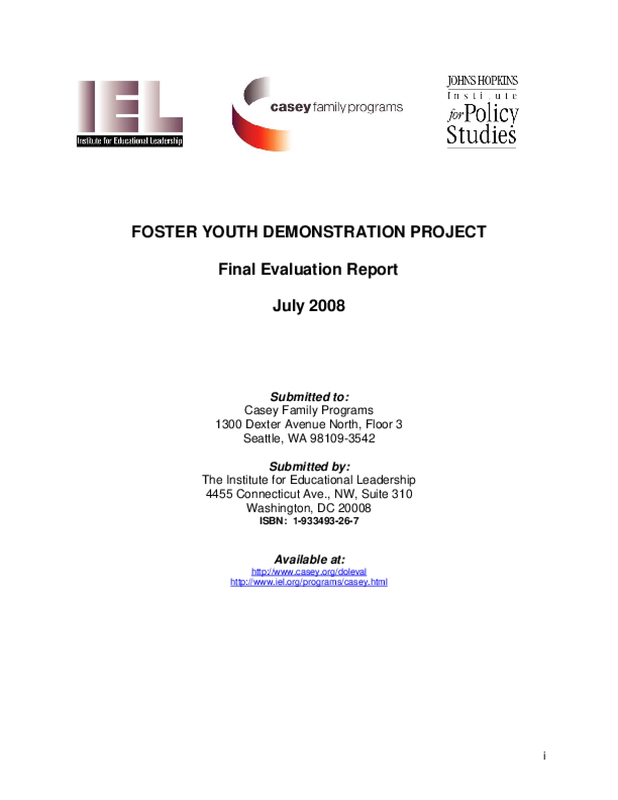 Youth from foster care may also experience mental health problems, drug usage, and involvement with the criminal justice system—all at higher rates than average.2 It is therefore not surprising that the U.S. Department of Labor's (DOL) Employment and Training Administration (ETA) chose youth in foster care and alumni of care, age 16–21, to be served in a five-state demonstration project.